A biochemist's startup company announced Monday that it had secured an exclusive patent license agreement with the Air Force Research Laboratory for a breakthrough technology that could help military veterans suffering from a post-traumatic stress disorder. Stephanie Davis, chief scientist and founder of the Boston-based Elke Therapeutics, said the agreement allows the company to develop the Air Force's patented neuropeptide Y binder as a stand-alone biomarker product or packaged with its proprietary therapeutic compound that modulates neuropeptide Y, a naturally occurring peptide that acts as a neurotransmitter in the brain. High levels of neuropeptide Y are associated with post-traumatic stress disorder and drug addiction, Davis said, and manipulation of the compound has been identified as a potential therapy for controlling neural alterations in patients. "This has an immense potential to improve healthcare," Davis said. "Its biosensor capabilities make it a great diagnostic tool and it can be used to monitor the effectiveness of neuropeptide Y drugs." The technology licensed by Davis was invented by four researchers at the Air Force's 711th Human Performance Wing at Wright-Patterson Air Force Base in Dayton, Ohio. 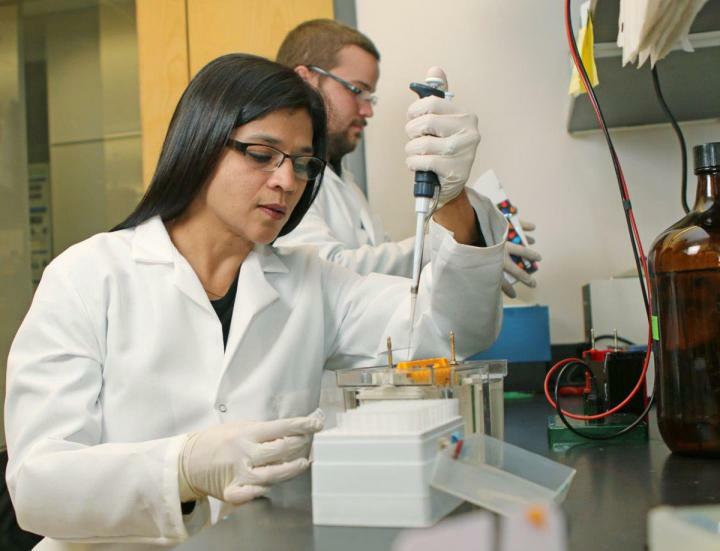 Established under the Air Force Research Laboratory, the wing's workforce includes world-class scientists and engineers advancing human performance through research and collaboration with surrounding universities and medical institutions. Davis found the Air Force technology in an online database of available military inventions built by TechLink, the Department of Defense's national partnership intermediary for technology transfer. TechLink works with the Air Force Technology Transfer Program, providing no-cost assistance to businesses that want to leverage Air Force science and engineering. According to the agreement, Davis has to pay an upfront licensing fee and a 4-percent royalty on sales. Joan Wu-Singel, a senior technology manager at TechLink, guided Davis through the express licensing process. "It's a young company but the science is there and Davis knows how to use it," said Wu-Singel. In addition to PTSD, Davis is working on related therapies for metabolic syndrome and cardiomyopathy. With the license secured, Davis said she plans to grow the company and move forward with in vitro and small animal studies. "As a part-time professor, I've had students who were combat vets with PTSD, and witnessed its effects," Davis said. "Our long-term vision is to advance breakthrough products, and we're structured for early-stage monetization to get us there."